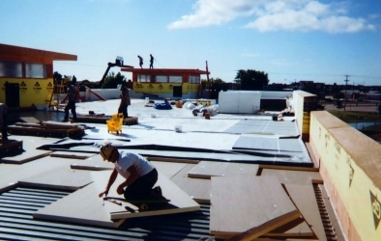 If you are a building owner or manager, roofing costs are probably one of your major concerns. Combined with today’s costs, it’s clear that managing your commercial roofing budget is important, especially for building owners with multiple buildings. Education and budget planning are the best defense to managing your roof. Proactive versus reactive roof maintenance is a good place to start. Those who react to problems as they occur, pay an average of 25¢ per square foot annually for maintenance. Those who inspect and repair routinely – before problems happen – spend an average of only 14¢ per square foot annually. Plus, proactively maintained commercial roofs last an average of 21 years compared to an average lifespan of 1 3 years for reactive maintenance. The longer you can extend your roof’s life before replacement, the more your overall savings increase and your life cycle costs decrease. While it may seem counter-intuitive, per job pricing should not be the primary consideration when choosing between providers. Instead, focus on the lowest roof life cycle cost. Fixating on the lowest one-time bid ignores the long-term roofing costs and typically results in a higher overall expense. There are many analytical tools that go beyond the visual, such as infrared scanning and membrane testing, that can pin-point with greater accuracy where and when the roofing problems might occur. This kind of analysis gives you the upper-hand to stay ahead of your roofs problems. A roof undergoes serious wear and tear throughout its lifetime, with factors like weather and degeneration taking their toll. Through scientific testing and analysis, an experienced roofer can outline the current condition of your roof and help you decide if roof repair is an option or whether replacement is necessary. The roofer must be familiar with building codes, energy solutions and roof systems—including all nine major roofing systems and more than 60 subsets—to help you make the best decision for your specific system and building type. A roofing contractor that has made an investment in the proper technology can help take the guesswork out of your roof maintenance decisions. Online software can help manage roof assets easier, and through a variety reporting options, you can more accurately determine your roof’s lifespan and avoid unexpected costs associated with emergency repairs. Also, technology used internally can also ensure the roofing provider has cost-efficient procedures and operations. Understanding your commercial roofing costs can be difficult, but when you know what to look for and are armed with the right questions, it is much easier to make the right choice for your needs to save you time and money in the end! Take a look at some of our Commercial Roofing Tools.